Breath, Movement & Sound Meditation classes are composed of breathing, movement & sound meditation techniques. Guided meditations are accompanied by the singing bowls to encourage relaxation and visualization. The Vajrayogini Practice is an ancient sacred art of cultivating feminine energy to nourish & heal ourselves, others and the Earth. This practice will teach you to live in fullness and beauty. When we are full, our radiance overflows into all aspects of our lives. The Vajrayogini is a feminine Buddha who came to teach women how to cultivate healing energy from the Earth. She teaches us how to step into the world from a place of fullness not emptiness. The Vajrayogini Practice is an energetic practice that infuses the vessel with healing energy to share with Self and others. The practice is ancient yet so relevant and useful in our lives today as we embrace the Era of Divine Knowingness. Is your healing bowl gathering dust? Not sure what to do with your bowl? Would you like to connect with your bowl? These and other questions will be explored as we strengthen our relationship with our bowls. In this workshop we will explore the seven (7) major chakras, the minor chakras and the nadis. Discover chakra balancing techniques to use on yourself and share with others. The aura is the electromagnetic field that surrounds the human body and every organism and object in the Universe. This field of energy around the human body has been described by different cultures in many ways. It is often described as bands of color or light … the “human rainbow”. In this 2 day and 1 evening workshop we will explore the functions of the 7 auric layers. Students will discover how to perceive, scan, and assist the human energy field using sound, crystals and affirmations. Mindfulness is being present in each moment & breath. Spend a day discovering how! A day of movement, meditation, laughter & play to awaken your joyful radiant Self. Feng Shui will assist you in calling positive energy (Chi) into all areas of your life, from family and relationships to money and career – you will experience flow, balance, harmony and abundance. The positive benefits of Feng Shui encourage harmony and happiness in relationships, increased prosperity and fame, and dissolve chronic patterns of failure, difficulty and stress. Brenda artfully combines her intuitive awareness with ancient Feng Shui concepts and principles. With her insightful knowledge, Brenda will assist you in transforming your environment into a personal paradise to create peace, harmony, health, abundance, and good fortune. In this fun filled and informative workshop we will explore the basic concepts of Feng Shui, with respect to the Tibetan Tantric Buddhist Black Hat Sect principles. Placement of the bagua in your environment, gua enhancements, cures and rituals will be explored. In this fun-filled and informative workshop students will be introduced to the Five Elements Theory. Students will also gain an understanding of rooms and their special meanings as well as space clearing rituals. Discover how to arrange your healing space according to Feng Shui principles while instilling a sense of peace and serenity. An excellent workshop for anyone creating a massage therapy, doctors or dentist office; yoga or healing studio; or personal meditation room. Studio Chi reserves the right to cancel programs and workshops with a minimum registration of 5 students. 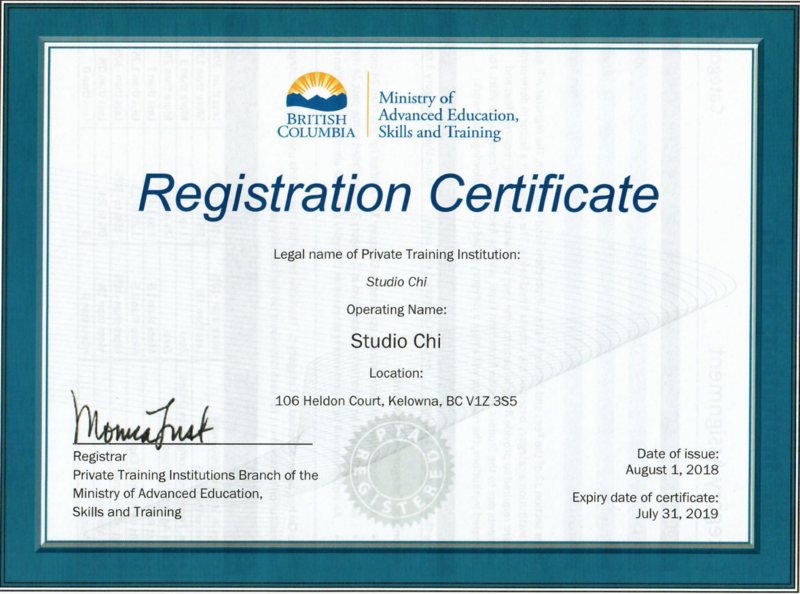 These programs do not require approval by the registrar of the Private Training Institutions Branch (PTIB) of the Ministry of Advanced Education, Skills & Training. As such, the registrar did not review these programs.